0.96 inch TFT color screen, make the screen clearer. The device will display alert for text message, so information will not be missed. Built-in 90mAh polymer battery, resolution 80*160. BT4.0, compatible with Android 4.4 & IOS 8.2 and above. 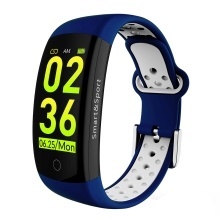 Heart rate sensor, make your exercise more scientific and effective. Functions: Global font, information reminder (3 pieces of information can be stored in the bracelet), support for page turning, call reminder (display name and phone), call rejection, drink reminder, sleep monitoring, sports record (pedometer, calorie burning, mileage Number), alarm clock, find a bracelet, find a mobile phone, shake a photo, time, day, date display, sedentary reminder, 24h 12h time format selection, metric inch choice, OTA. Bracelet language: Chinese, Japanese, English, French, German, Italian, Spanish, Russian, Portuguese, Polish, Malay. APP language: Chinese, Japanese, English, French, German, Italian, Spanish, Russian, Portuguese, Korean, Malaysian.